Probably the single most common mistake made by gardeners growing tomatoes involves watering them. Sometimes it’s too much, other times it’s not enough, and occasionally it’s how it’s done that causes the problem. 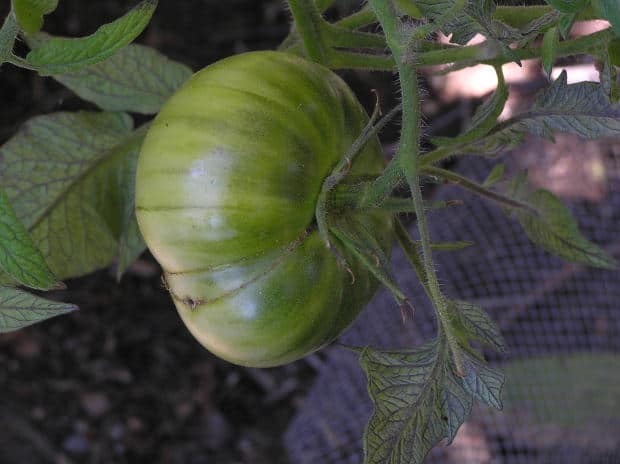 Tomatoes are particularly sensitive to water issues, so the good tomato gardener will know what to look for and change it before it becomes an issue. These problems are avoided if watering is done correctly. BER and fruit splitting are the most common issues that even experienced tomato gardeners will face. Both are due to a lack of water getting to the plant, either because there isn’t enough watering or because water is somehow not going to the roots of the plant. Getting water to the roots is an issue for every tomato gardener is can be caused by several things that may not be entirely in the gardener’s control: weather, soil condition, and runoff. The weather (atmospheric conditions) can cause water to dry up before it penetrates deep enough into the soil to get to the plant roots – sometimes, in very hot climates, drying before it even touches the soil. This is why watering at ground level, at the plants themselves (see below) is important. Soil that is too compact or has developed a clayed top crust is another barrier to water absorption. This will cause water to either not penetrate deeply into the soil or to runoff before being soaked into the dirt. Either case is a problem for tomatoes that need the moisture. When they don’t get enough water, tomato plants become droopy and then begin forming problems like BER and splitting. They will also underperform in both growth and fruit production. So watering properly is the key to success with tomatoes grown indoors or out. There are many techniques for watering tomatoes. No one is necessarily any better than the others, but one maxim in tomato watering stands firm. I call it the John Wayne approach: water low, slow, and deeply. Just as the Duke talked low, talked slow, and said deep things so should your water be presented to your plants. Water at ground level (low), use slow methods of delivery (trickle pips, soaker hoses, etc. ), and water for long periods so it penetrates the soil deeply. Watering from the air (sprinklers) sends more water into the atmosphere through evaporation than it does to the soil. It also spreads the water, making it less likely to penetrate thoroughly. Likewise, flooding the garden can mean too much water too quickly, which can choke the roots (which need to breathe oxygen from the soil along with water). Flooding also tends to wash nutrients away rather than deliver them to the plants and encourages the clay cap effect mentioned earlier. Remember: low, slow and deep. Always water in the early morning or evening when the weather is coolest. Water more often in smaller amounts on a consistent basis to keep the soil moist but not flooded. This keeps fluctuations from happening (dry spells, too-wet spells, oscillating). Overall, be consistent about your watering habits and your plants will adapt to the conditions you’re giving them. Inconsistency causes more problems than doing too much or too little of anything. YouTube features this DIY tomato watering system. Different rules for indeterminate container tomatoes in the deep south. I water twice a day if the temp is over 85, morning and early to mid afternoon. I splash hose water against the inside wall of the container until it pools so I fdon’t disturb the soil too much. I have several bottom holes in containers. I also wet tall foliage. I have to do this to prevent wilting. I have kept most of my vines alive and producing well into July for eight years now. I always lose some, especially romas for some reason. Another trick is to skimp on direct sun. My vines get 6.5 to 7 hours. Today June 16th near Atlanta it was 94 and clear. My vines are full of produce and show no wilting at the top. So far so good. Thank you for this demonstration. Is the water supposed to run that fast? What was the mark (arrow) on the pipe for? Hmm, most of the advice I have read before states the opposite from the advice given here: I have learned that watering should be done deeply and rarely, so the roots will learn to grow where the water is – deep in the soil / container. thanks for sharing knowledge. I want to grow ginger this year. can somebody tell me the complete procedure. I mean which month to sow, how to sow, care to be taken & when to harvest. my facebook & gmail address is same as mentioned above. I will be grateful. I will prefer posts by FB. I water as t night . I also water the leaves misting . I live in Ohio. Cool at night. Some -Times past July.